To the Right Worshipful the Mayor of Melbourne... [from] the undersigned Inhabitants of Melbourne considering the Unsettled State of a portion of the Diggings, and the necessity measures for the Better PROTECTION OF THE CITY, and upholding the cause of Law and Order, hereby request your Worship to convene A PUBLIC MEETING... John Ferres, Government Printer, 05 December 1854. State Library of Victoria Collection (H141396). Melbourne is the capital city of Victoria, Australia. 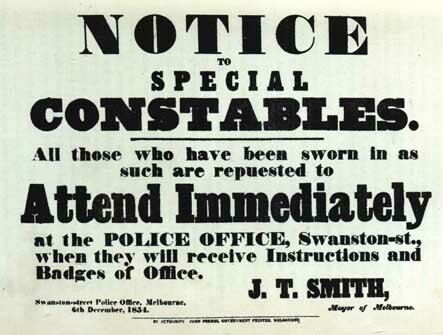 After the Eureka Stockade rumours of an attack on Melbourne resulted in special constables being sworn in. 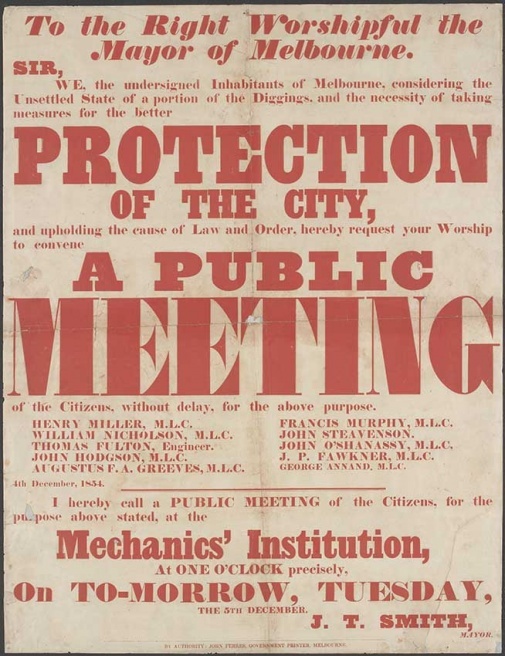 Was Melbourne in Peril?— Those were days of leisurely news-carrying. The Stockade was taken by assault at daybreak on Sunday, December 3, 1854, and the news reached Melbourne just too late to appear in the morning papers on Monday. For a day or two before it hac been rumoured that an army of infuriated diggers was about to descend on the capital. 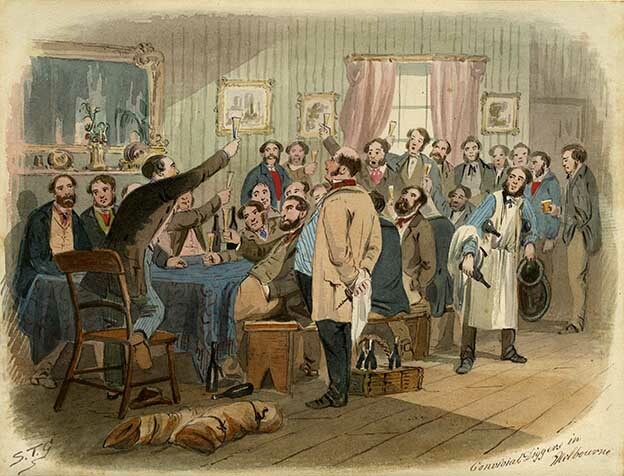 All troops available had been sent to Ballarat, and the leading shopkeepers cla moured for the enrolment of a rifle bri gade and the swearing-in of all respectable people as special constables. lt was a great chance for The Age, then just established. This democratic infant declared that the civil war was 'not against the Crown but against the pollutions and abomi nations covered by its sanction." Ad ditional troops were brought in from Tasmania; and, with the news of the complete crumpling up of the Stockade and of the rebel movement, a quick reaction set in. Strong anti-Government speeches were made at a great meeting where the Cathedral now stands-by some of the city's most representative men. Then came on the trials for high treason. ↑ Adelaide Registrer, 29 March 1913. This page was last edited on 24 April 2018, at 13:12.